Damien gained his Bachelor of Physiotherapy from the Uni of QLD in 1999 and commenced with Coastal Physiotherapy in 2003. Along the way Damien attained a Masters in Sports Physiotherapy (2006) from Latrobe University. He was titled as an APA Sports Physiotherapist in 2007 and has worked with athletes of varying ability including stints at the AIS and Essendon FC. 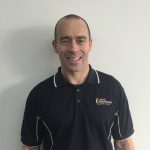 Currently he is a physiotherapy consultant to Tennis Australia; Tasmanian Institute of Sport; AFL Tasmania as well as the Burnie Dockers State League football team. Damien is also completing a post-graduate research doctorate through Latrobe University, determining the most effective exercises for the gluteal and quadratus femoris muscles using fine wire EMG. Damien is credentialed in Mechanical Diagnosis and Therapy (aka McKenzie method) and certified in DMA pilates, dry needling, Selective Functional Movement Assessment (SFMA) and Functional Movement Screening (FMS).